If you’ve ever seen a small squirrel scurry across the ground to disappear into his burrow, you’ve encountered a ground squirrel. Marmots aren’t as common, but if you’ve celebrated Groundhog Day, you've wondered if a marmot would see his shadow. Both are members of the squirrel family and share some similarities, but differences like size and habitat distinguish the two. The biggest difference between marmots and ground squirrels is size. Ground squirrels are typically less than a foot long. Some species have long bushy tails, like the California ground squirrel, and resemble tree squirrels. Other species, like the white-tailed antelope squirrel, have short tails and resemble chipmunks. 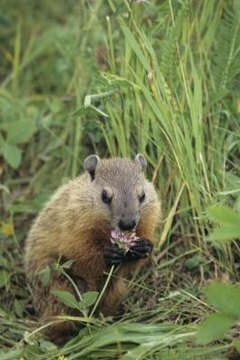 Marmots, called woodchucks or groundhogs in the U.S., are much larger than their squirrel cousins. Marmots average about 2 feet long. Aside from sheer size, ground squirrels and ground hogs have different body types. Ground squirrels are usually slim and lightweight. Most squirrels only weigh a few ounces, although the largest species can weigh around 4 pounds. Marmots are the largest members of the squirrel family, and usually weigh around 13 pounds. Marmots have a stocky, rotund build in stark contrast to the ground squirrels streamlined frame. Marmots do have bushy tails similar to a squirrel’s, but it's short in comparison to their size, only around 6 inches long. Ground squirrels live all over the world. They can make themselves at home in the forest, desert or even the suburbs. Marmots are only found in the northern United States and parts of Europe and Asia. Both marmots and ground squirrels build underground burrows where they hibernate during the winter. A ground squirrel’s burrow is typically only 4 inches wide and less than 3 feet underground. Marmots can burrow up to 6 feet deep and can have up to 40 feet of tunnels. Ground squirrels are omnivores, meaning they eat both plants and animals. It’s common knowledge that squirrels eat nuts, but they also enjoy leaves, roots and seeds. Ground squirrels will also frequently chow down on insects and small animals, like mice. Marmots are herbivores. Their favorite foods are grasses, clover, fruits, berries and vegetables. They will eat some insects, like grasshoppers or June bugs, from time to time.